Lately I feel like I’ve been on a small run of creativity so I’ve been wanting to hammer out these ideas while I remember them and if some of the items that helped produce it are still in an event to promote them while they are still available at these places. This is likely one of the first times that I’ve ever blogged a backdrop as one of the main sources of inspiration for a post; most of the time it’s a pose, clothing or an accessory that helps me put an idea together. Joplino’s “Skatecave” is definitely the photography aid for those who are big fans of action sports or just skateboarding in general. It has several different spots within its structure that still pictures can be taken or with a skateboard for that grinding/shredding action. The walls have graffiti on them which gives it a skate culture feel. As such with a backdrop there’s not really a lot I can speak about concerning “features” like I can with clothing and accessories. It’s very cut and dry that you see what you get and it’s definitely worth your time going to The Men Jail event and seeing it for yourself and you have until the 28th of July to do that but why wait until then? Head over there now! Pose Fair still has a good amount of life left for it’s July round as well and as a late entry, Image Essentials has released three new pose packs but I am focusing on one for the guys and it goes by the name “B-Rad” and that seems rather fitting for a skateboarding type scene wouldn’t you think? The poses are all static as well as bento capable and if you were to ask me to best describe it, I would say they are all very chill and laid back stands which is right up my alley when I don’t feel like doing anything intense that requires action. Available @ Pose Fair until July 31st! This post is rather heavy with items from The Men Jail (included the backdrop I’ve already mentioned), in fact I would say close to half of my look and outfit are items from the event; as you can see there are a lot of various items you can get at the event which is nice to have a variety. Most men’s events do have these things but there are just so few of them that you have to take what you can get. 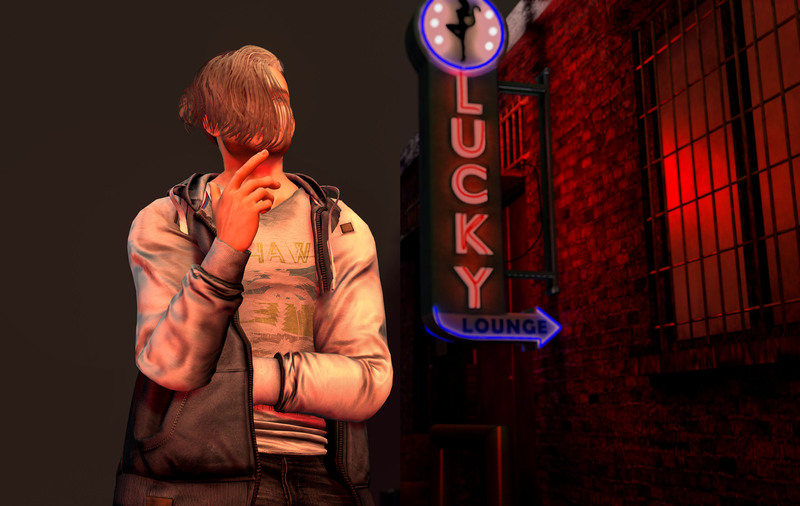 L&E has this hair/bandana combination for sale at TMJ which I thought fit my needs exactly for what kind of look I wanted to achieve for a skater dude, the way the hair is styled reminds me of professional baseball player Bryce Harper, which reminds me of his appearance recently during the 2018 MLB Home Run Derby. It’s has the wet look to it with strands sticking up here and there and also really could be worn for maybe a summer photo working outside in the heat as well. The headband (which is also packaged individually) has quite a few choices for designs that I almost had a hard time choosing which one I wanted to use and I looked at them all and narrowed down my choices and finally made a decision. Having options is a great thing but I don’t have to tell anyone that because it’s just one of those truths. Sticking with my coverage of The Men Jail, I am also wearing the R2A “Vest Shirt with Bag” (the bag itself I didn’t include in the shot) with the thought that it most definitely gives the skater vibe that I was looking for. It’s not a full sleeved shirt and it’s baggy as well which is good for movement and wouldn’t be restrictive to someone that skateboards. The bag that comes with it is comparable to a fanny pack (if you are younger and are not familiar google it now but don’t forget to come back!) I chose to omit it from the photo because I didn’t feel like it worked with the idea I had in my head but it is a cool added feature. I haven’t forgotten The Men’s Department as I mentioned in one of my previous posts that there would be more items from the event featured on the site and that comes in the form of these Capri Shorts from TonkTastic, who have been making some excellent clothing items in the last year or so (including the collabs with Hermony which were fantastic). These shorts are at a length that I like but the fact that there are so many choices color and fabric wise that it caused me to choose because buying the entire collection was not an option for me at that moment so I chose to go with denim because I don’t recall having anything like it in my wardrobe. It fit with my ideas for what I wanted to wear for the photo and all fell into place naturally. It doesn’t always work that way as many bloggers will tell you there is generally a snag in even the easiest plans which is why when putting everything together and not having any hiccups upon the shooting process. 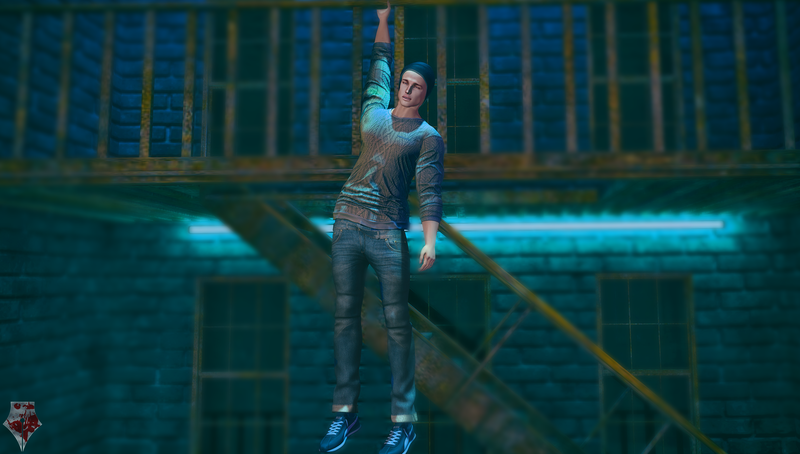 I also have to give props to Versov for the skateboard I used as a prop, it’s from their gacha that was first released at the June 2018 edition of The Arcade. 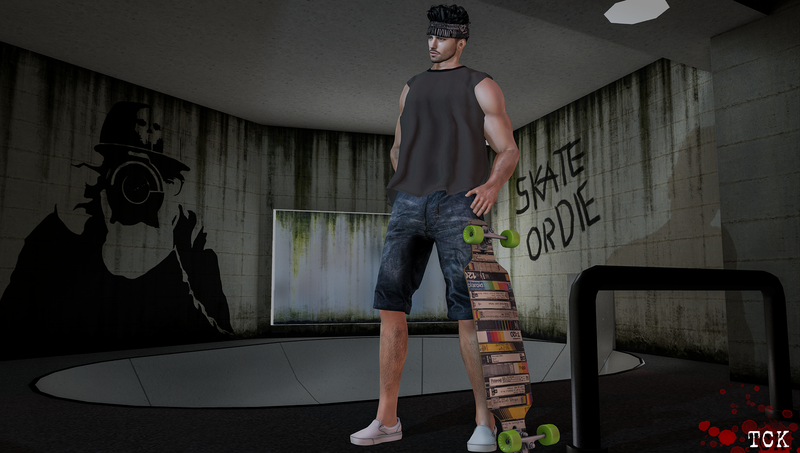 You can play the machine at their store and get all the different longboards as well as the two RARE skate shoes which I’ll eventually get around to featuring in a blog post considering I love shoes a ton (like a metric ton). Speaking of shoes, the ones I am wearing for this look come from The Men’s jail as well and are from Dossier (whom I’ve worn in several blog posts recently). The “Slip-On Konshu” are similar to like the Vans slip-on shoes you can get out in the real world and with this release you get all of the color/styles in one release. Yes you get the entire FATPACK and the cost of them is a value. If you need some slip-ons these will do well for you and that’s definitely a bargain you can feel good about. Currently @ The Men Jail until July 28th so head on over! Now that all the information I can think of about the majority of the featured products of this blog are done with I think that it would be fair to wrap this up so that I can start to plan the next scene and get it photographed by the weekend (or possibly sooner maybe). There’s still plenty of things that I’d like to show on these pages and also Men Only Monthly is coming back for the July/August round which is exciting as well. The productivity I’ve been feeling over the last few weeks is also a pretty good one and not in a way where I feel like I’m just trying to hammer stuff out to meet a deadline. The ideas have been coming along with the help of products I’ve received from events or ones I’ve purchased on my own accord. I hope that I can keep a steady pace and as July transitions into August come in swinging heavy. Merry Christmas everyone or Yule for those of you who participate. I didn’t anticipate having the time to be able to post anything for a few days with the holiday festivities but I managed to steal a few minutes of time while the family festivities calm down a bit. I’m not going to get overly wordy this time since I figure everyone that views this is going to be doing it on the fly. I really wanted to do something upbeat since I have been in a super good mood lately and the song I chose as the theme for this really fit in with some of the elements of the scene. It also helps that Paparazzi created a backrop that came complete with a Fire Escape, how did that happen to work out so well? I really just needed to find the right outfit and I feel like I did. This blog entry features goodies from Avi-Glam (a brand partner), TonkTastic & Hermony (brand partner as well), Bleich, and Ohemo. I suppose you might be able to classify this look as hipster, though I’m not sure where the line starts to blur as I’m not wearing a thick beard in this look; I made it colder weather chic with the sweater and beanie as well. 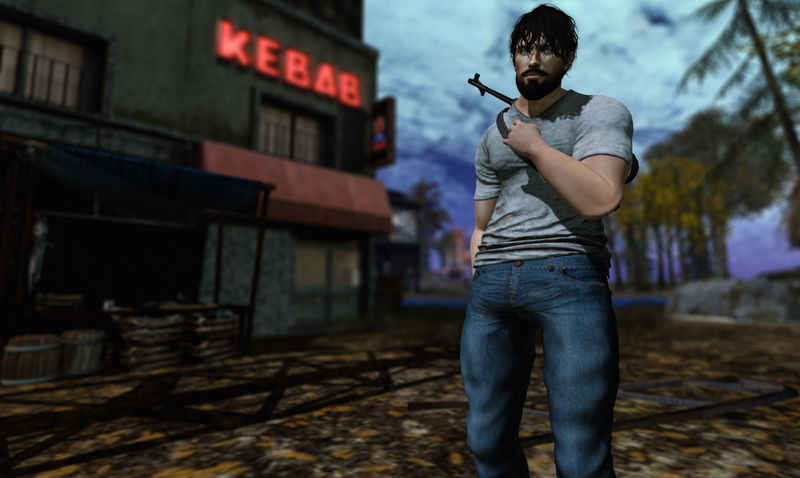 As I just mentioned, this post includes Avi-Glam which I am featuring two items (one older and one newer). The skin comes from the Man Cave event and is called “Nero” and I’ll tell you more about it down in the credits. The “Hope Eyes” I have previously blogged but I had not worn this particular color before and really liked how it looked with the rest of the look I put together. In other great news: this past week CATWA released a new male head to add to their lineup. “Victor” is his name and he definitely has a charming but rugged look to him. I will give you more of my thoughts down in the credits as well. I think it is one of their best releases though that has come along and I was excited for it before it even hit the store. To everyone reading, I hope you’ve had a wonderful holiday and have surrounded yourself with the best people in your life. They are the ones that support you with whatever thoughts, dreams, and ideas you have and guide you to help make them turn into a reality. I’ll be back again soon with another look and more current events coverage to show you. With the latest male head release, CATWA has the fellas scrambling to the store to check out “Victor”. Personally I feel like it’s a cross between the “Daniel” and “Stanley” heads but just a little more toned down in the jaw region. Not as hardlined as “Stanley” which for those who were not a fan of the head might gravitate towards this one a littel bit more. It comes with several different neck choices as well as a few add-ons for the teeth. Everything you’ve come to expect from CATWA is a part of this product. “Nero” is a very soft skin and gives the Victor head a little bit of contrast because it’s also a bit rugged but not aggressively so. With this release the brand has added two new tones to their lineup: Chocolate and Espresso which gives you the choice of 10 different skin shades to find the best one for you. You can find the body appliers at the main store to purchase if you don’t already have them. After pairing up twice before to bring us fellas some really awesome graphic tees, TonkTastic & HERMONY are at it again. They’ve come together one more time to bring us a crewneck sweater that comes in 4 different packs with 12 designs in each pack. That’s a lot of wear choices so you could wear a different design every day for a month and not wear the same one if you chose to. That is one of the reasons why I like these to brands doing a crossover because you’re going to get style from the jump. The sweater is available until the 31st so take a quick trip to TMD and try it out for yourself. Compatible With: Aesthetic, Belleza, Classic, Signature, SLink and TMP male bodies. I originally bought these jeans at the November round of Men Only Monthly and couldn’t find anything I wanted to pair them with until now. I like the worn look of these jeans as Legal Insanity is really good for making quality products with that specific style in mind. I am a really big fan of their jeans as I’ve purchased quite a few pairs of different styles over time. The quality is what brings me back to them when they release something I really like. 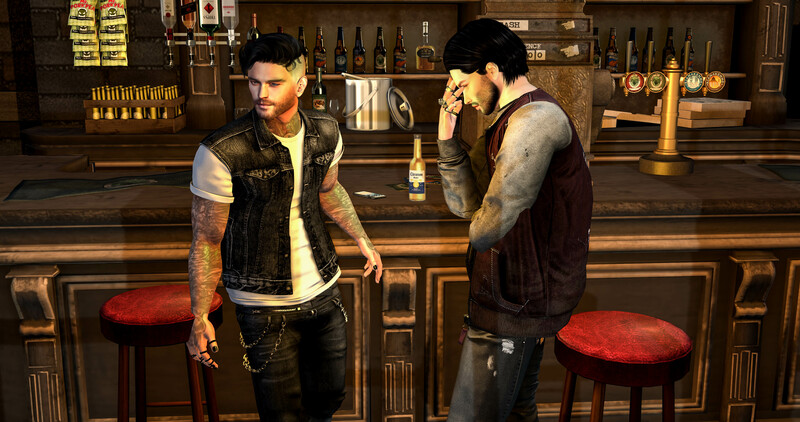 Compatible With: Aesthetic, Belleza, EXMACHINA, Signature, SLink and TMP male bodies. Regular and Bootcut versions included with the product. I found this beanie at one of the previous rounds of Cosmopolitan but sadly time restraints and other scenes I wanted to do prevented me for featuring it during the round it was offered up at. 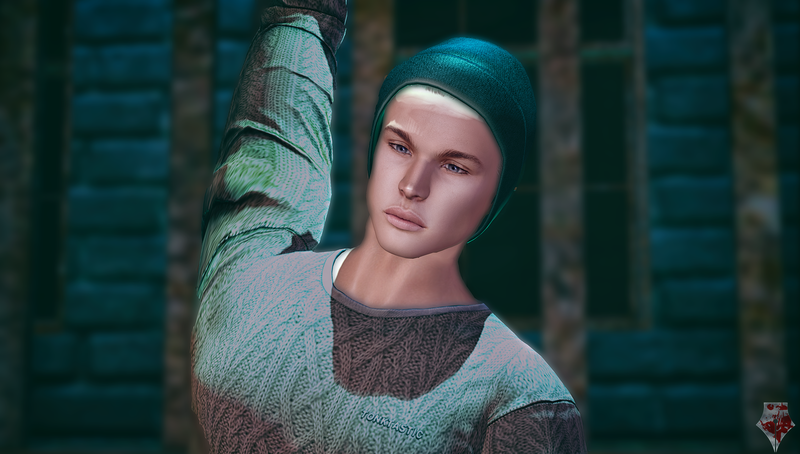 This beanie works well with the CATWA head because of the alpha feature that allows for the ears and back of the head to go invisible for wear with hats like this. Two versions are included (one with materials and one without) and there are several different colors to choose from other than black which I felt suited me best. This backrop was the originally available at the Limit8 event, however, it was not the Limited Edition version and should still be available by heading over to the Paparazzi main location. While you are there take a look at some of their other useful backdrops as I’ve been featuring them quite a bit in the last few scenes that I’ve put together. This building with a fire escape built in is a sight to behold; photos do not really even do it justice compared to looking at it up close. This brand really knows how to create useful backdrops that any photographer or blogger can use to create magic.